You blew it. I cursed myself as I turned the key in the Nissan ignition. It's mid-January, and so far the winter has seen a conveyor belt of systems roll across Northern California. 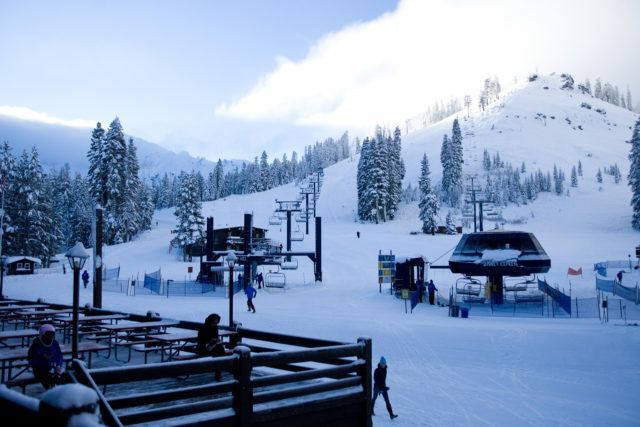 This was supposed to be my escape to winter—scraping together a last-second ticket to Reno for a few days at Sugar Bowl Resort, one of California's oldest and snowiest ski areas. Yet, here I am, 45 minutes away, scrambling out of Kings Beach at 8:30 a.m., half dressed with a piece of peanut butter toast hanging from my mouth. Twelve inches have fallen on North Lake Tahoe overnight, and as I speed from the shores of the lake, my only thoughts are on the first tracks I won't be scoring. I pass the parade of cars in the opposite lane inching off I-80 toward North Tahoe's usual suspects—Northstar, Squaw Valley, and Alpine Meadows. After the weathered family cabins that line Old Highway 40, I turn into Sugar Bowl's half-empty Judah Lodge lot. Anxiety gives way to confusion, and confusion to uncontrolled man giggle. I realize I just reverse-commuted the entire Bay Area. I skate up to the 20-person lift line as avy bombs echo from the mountaintops. Maybe I hadn't blown it after all. When Sugar Bowl fired up California's first chairlift in 1939, the Transcontinental Railroad delivered city skiers right to its base, and for two decades every Tahoe-bound traveler had to pass the parking lot along trans-Sierra Highway 40. The area quickly became a popular landing spot for San Francisco well-to-dos and the Hollywood elite, attracting the likes of Greta Garbo, Errol Flynn, and Walt Disney. Through the middle of the 20th century, skiing on Donner Pass was the party everyone wanted to go to. But that soon faded during World War II, when many of the nation's skiers enlisted and the railroad curtailed passenger service to accommodate military and shipping needs. The train doesn't stop on Donner Summit anymore. Now, a long tunnel connects the San Francisco line directly to downtown Truckee. Additionally, the highway traffic that once pulsed through the area was rerouted north to I-80 in 1960, taking the glitzy hotels, nightlife, and a majority of the ski-bound traffic with it. It was the death nail for a handful of ski areas on the pass. But, through a unique co-op ownership model and a set of geographic advantages, Sugar Bowl ducked the waves that ended the ski boom on Donner Pass. It's the snow—averaging 500 inches annually—which also wrote the famous Donner Party into elementary school textbooks and first attracted U.S. Ski Teamer Daron Rahlves. 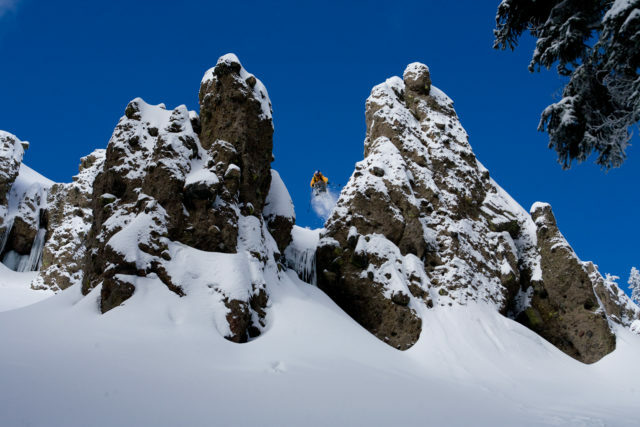 "These are the cool little resorts that got people skiing and gave them the bug. 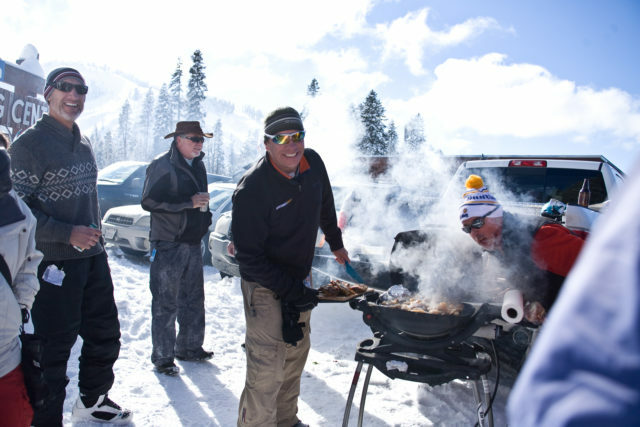 It's important to remember that," says Mitzi Sayler Hodges, owner of the Donner Ski Shop. She grew up on Donner Summit, when her dad ran Donner Ski Ranch—a family ski hill famous for being the nation's first to allow snowboarding—across the parking lot from Sugar Bowl. A foot of fresh cushions my drop into the ponderosa pine forest off Crow's Nest Peak. Sugar Bowl's vertical gain tops out around 1,500 feet, but it has perfected the short, steep, and sweet game, from the trees at Crow's Nest to the myriad of cliffs, chutes, and gullies off the resort's marquee peak, 8,383-foot Mount Lincoln. "I feel at ease here," says 35-year-old Jon Rockwood, on our way up the Mount Lincoln Express. "There isn't that Tahoe rush. It's a completely different way to ski." Shielded by Mount Judah and Mount Disney, Lincoln offers some of the only high alpine terrain in the region open on storm days. I catch the late rope drop on Fuller's Folly, picking off solo turns through wind-loaded halfpipes and hot-lapping the Mount Lincoln Express until my legs are fried. Geography isn't the only thing protecting this tiny alpine enclave. Sugar Bowl is owned by a collective of homeowners in the area's snowbound village. The group has final say in all major resort decisions and has directed nearly $60 million of profits and shareholder money back into ski operations—namely new lifts, new lodges, and terrain expansion—since 1990. The homeowners shoulder the brunt of the mountain's financial needs, and in turn the resort keeps hotel chains away from the quiet base village. It has remained in private hands the entire time, preserving a purer identity in the time of resort conglomerates and faceless ownership. Many of the shareholders are second homeowners, and the insular growth keeps them happy. However, it's the locals who often score the biggest dividends after the weekend crowd heads back to the Bay. "I feel at ease here," says 35-year-old Jon Rockwood, on our way up the Mount Lincoln Express. "There isn't that Tahoe rush. It's a completely different way to ski." Rockwood came to Tahoe after graduating from the University of Vermont, and the New Englander quickly gravitated toward Sugar Bowl's weekday solitude and easy backcountry access. Living near Donner Lake at the base of Old Highway 40, Rockwood can ski off the top of Sugar Bowl's Judah Peak and arrive at his house—3,000 vertical feet of lake-view fall line later. Though ski commuters usually opt for the convenience of six-lane I-80, Sugar Bowl continues to plow Old Highway 40 on its own dime, providing a backdoor entrance for Rockwood and a dedicated following of Sugar Bowl skiers. With a four-gate open-boundary policy (in conjunction with the U.S. Forest Service), much of Sugar Bowl's magic lies off the trail map, where I meet Rahlves, the area's prodigal son. From Kitzbühel to kick turns, Rahlves leads the skin track on a sunny Monday morning. The former World Champion is fresh off a plane from forerunning the vaunted Hahnenkamm downhill, a race he won in 2003. Born in the Sierra foothills, Rahlves adopted Sugar Bowl as his home mountain in 2001, and the area has been his sanctuary ever since. "It's crazy out at these races, so it's nice to come home from all of that and just ski," says the 43-year-old. The Anderson Chutes, the quick, steep lines just out of Mount Lincoln's gates, are also perfect training for his annual trips to Alaska. With a rotten snowpack finally settling out, Rahlves makes light work of early season spines between volcanic spires and steep chokes, taking advantage of the cold temperatures and morning shade. We opt out of the Donner Lake lap that heads toward Rockwood's home and the valley below, climbing over to front-side leftovers on Silver Belt, the original muse for his brainchild and one of the craziest races on skis, Rahlves' Banzai Tour. Part downhill, part ski cross, with a dash of roller derby for good measure, the Banzai Tour is a major event at Sugar Bowl every season (the 2016 race was cancelled due to weather). It is an adage to the original Silver Belt Race, a Sugar Bowl classic that brought the nation's finest skiers to Tahoe and beat them up through steep bumps, trees, cliffs, and gullies for the better part of a half-century. Times and equipment have changed since the first running in 1940, but Rahlves likes the idea of keeping tradition alive in places like this. Donner Summit has slowly faded from the skiing limelight, which tasks Sugar Bowl with a similar charge. It only takes the first drop off the Disney Nose or a day working the backcountry trifecta between Mount Lincoln, Anderson Ridge, and Mount Judah to realize that the Bowl's skiing holds up. But it's also a duty wrapped in family cabins, small ski hills like Soda Springs and Donner Ski Ranch abutting it, and the generations of families like the Hodges that have found a home in the forgotten pages of Donner Summit lore. "The history up here is part of ski history," says Hodges. Traveling on a budget, Kade Krichko had $1,000 to get from Seattle to Sugar Bowl. Over five days, he spent $636. While trying to bum floor space at the Donner Summit Lodge employee housing during a snow storm, Krichko quickly learned that the success rate of a random unkempt traveler asking to invade someone else's unkempt personal space is shockingly slim. Hitch a ride on Old Highway 40. Any vehicle heading up this local back road knows the deal with the Donner Lake lap and nine out of 10 are willing to give you a ride up. The 10th? Well you probably don't want to ride with that guy, anyway. Sugar Bowl's lift ticket doesn't scream small-town hill, coming in around $100 a day. But it beats the $139 at nearby Squaw Valley. Brown-bagging from Soda Springs General Store. Tony, the frizzy-haired Deadhead manning the cash register, moved to Donner Summit after spotting the vacant storefront on his second date with a Sugar Bowl ski patroller. The two married and now they sling delicious baked goods and fried food and will even wax your skis on the way to the hill for a fraction of what you'd pay at the resort. Grab a beer on the sundeck outside the Belt Room. The village's only true bar, this is where Walt Disney used to celebrity bartend on weekends. Rumor has it he made a better Old Fashioned than a slalom turn.